PRODUCT DESCRIPTION: This medium spreader is designed to apply granules on lawns and gardens. The granules can be any type of fertilizer or insecticide. 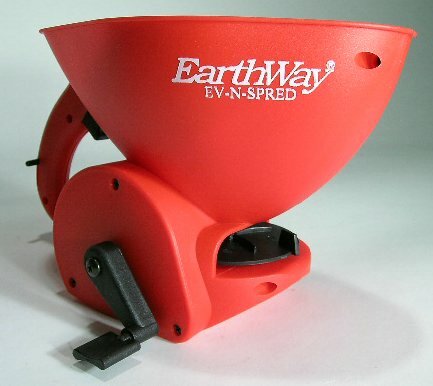 All three of our spreaders work off the same principle but one is an entry level small spreader designed for light work, the medium one (pictured here) is a step up and can handle a larger work load as well as more granules, the deluxe model also can handle a larger load, with many features. This medium spreader is more durable, has a larger holding tank and can handle jobs up to 10,000 sq/ft. The tank is larger however all three spreaders have similar features. 1) They work by turning a crank which twists a prop located on the bottom of the holding tank. To treat you depress a button which allows granules to fall out onto the prop which is being turned by the crank. The prop in turn propels the granules 5-10 feet around. 2) They can use granules of just about any type as long as they are designed to be used around homes and gardens. 3) They all have adjustments so that you are able to control the rate at which the granules fall out the bottom. 4) They are all portable and can go where you walk – a great advantage over push or pull type applicators. 5) All propel granules evenly and consistently. 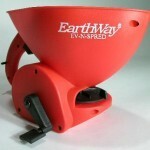 The differences between the three units is an entry level spreader is designed for small or light jobs. It's holding tank is the smallest of the three but it does work and is adequate for most applications of 5,000 feet or less. WHERE TO USE IT: All can work well for treating most any yard, plant bed or hard to reach area under decks or behind structures. All are easy enough to carry up steep terrain and all allow you to treat where conventional push or pull type spreaders simply cannot go. How does this spreaders distribution rate compare to a Scott’s spreader. Ready to spread Scott’s Grub ex and it says 3 1/2 for rotary spreader and 5 1/2 for drop spreaders. Shall I set the EV N Spreader on 1, 2 or 3? Thank you. In general, we recommend "testing" the spreader with the granules you want to use. This way you will learn for sure how fast the product comes out thus reducing the chances of over applying it. So lets say the rate for your granule is 2 lbs per 1,000 sq/ft. We would recommend putting 1 lb in the hopper and then setting the number at 1 and see how it goes out over 500 sq/ft. After going over the 500 sq/ft, you should be able to gauge if you need to change the setting to 2 or 3, if its coming out too fast which would mean you'll need to move faster when putting them out, etc. The reason its best to use this approach is two fold. First, the rate any granule will come out is based a lot on gravity and friction and this can vary a lot from product to product. Second, the size of the granule can either plug or impede the release and its hard to judge what might happen so its always best to "test" it first.